First Max Fish makes a return and now this. 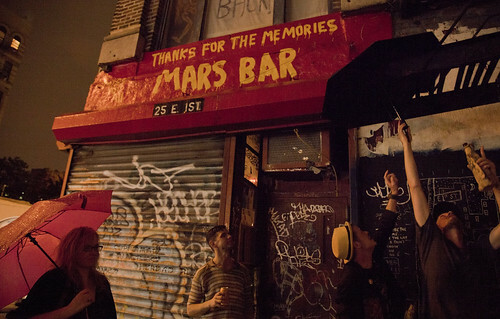 Mars Bar is coming back – in some form – to its former digs on Second Avenue. “We are going to reopen,” owner Hank Penza told us. Will it be a bar? a restaurant? “We have to decide all that,” he said, indicating that the ownership has changed and he now owns 50 percent of the bar, with three partners owning the other half. The 80-year-old declined to say who the other partners were or whether they owned other establishments. But State Liquor Authority records show the license (currently inactive) is also in the name of Donald Capoccia, Joseph Ferrara, and Brandon Baron. Those would be the owners and operators of BFC Partners, the developer that demolished Mars Bar’s old building in order to build the Jupiter 21 apartments. During a State Liquor Authority hearing back in June of 2013, a lawyer representing the new establishment said his client was “partly the owner of the building and partly the original licensee.” He also said food would be served. Even before July of 2011, when Mars Bar closed in order to make way for Jupiter 21, Penza told The Local East Village that he planned to reopen in the new building. But with a TD Bank taking over the bar’s corner nook, chances of that actually happening seemed slim. The bar’s alteration will be discussed by CB 3’s liquor license committee on May 12. Update, 8:50 p.m. The original version of this post was updated to add the identity of Penza’s partners. Correction: The original version of this post was revised to correct the first name of Mars Bar’s owner.